I am honored to be the new President of HKSSM in 2012. Our Society is dedicated to promoting clinical practice, knowledge and training in Sleep Medicine in Hong Kong. We are delighted to invite you to join our ASM on 29th September 2018(Sat) in Hotel ICON. This year, we invite Prof Phyllis Zee as our plenary speaker and she is a leading expert on circadian rhythm. 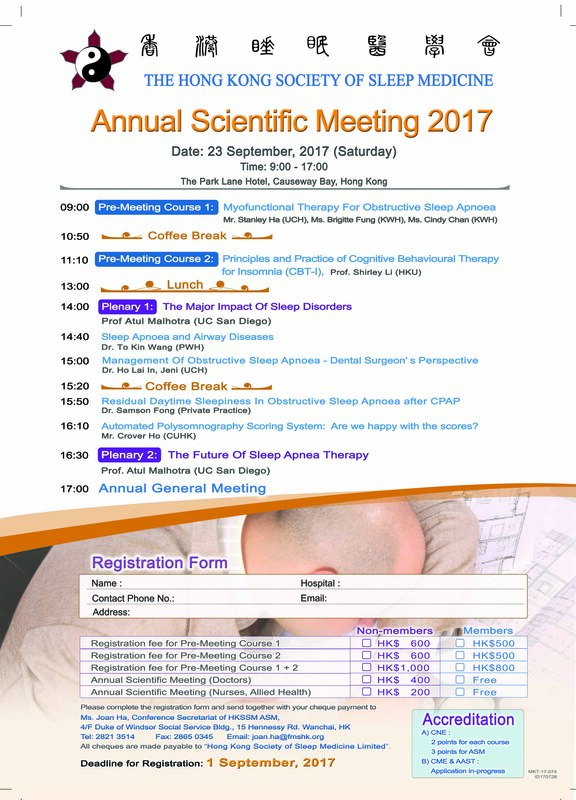 Also, we are organizing a morning workshop on “Myofunctional Therapy”, which is a hot topic for management of obstructive sleep apnea. Please refer to the attached poster for program and application details. Register early and looking forwards to seeing you at the conference! Topic: Nocturnal groaning - what is it? This year, we are going to have two pre-meeting courses and ASM. We invite distinguished speakers & professors to give their up-to-date knowledge in sleep medicine, including Prof Atul Malhotra from UC San Diego. The Hong Kong Society of Sleep Medicine will host public talks and media interviews to foster and promote the public's awareness and understanding of common sleep disorders. World Sleep Day,by the Heng Sang Management College, 5th Cultural fun society.